· By Bill Keaggy on August 23rd, 2009 in Beyond groceries, Weirdness. 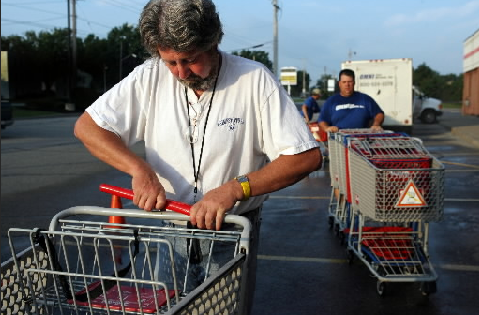 Ever wonder what it’s like to repair shopping carts? Me neither, but here you go! Chuck at work. Photo by Lynn Ischay/The Plain Dealer. Mike Cool — honest, that’s his name — is the operations manager for Omni’s Mentor office. Among other things, he’s in charge of the two crews in Ohio — out of 20 or so nationwide — who inspect, clean and repair shopping carts at nine regional grocery stores and discount centers. I got to work with one of those crews — foreman Chris Tussey and his helper, Ernie Sparks, based out of Cincinnati — at the Euclid Save-A-Lot one morning.